The Samaypuram Maariamman Temple at Samayapuram in the region of Tiruchirappalli (Trichy), is one of the most visited temple by devotees in Tamilnadu, committed to Maariamman, a sign of the antiquated vitality Shakti as the mother Goddess. Nearby varieties of the adoration of Shakti, the mother Goddess is seen all through the Indian subcontinent. The main deity, Samayapurathal or Mariamman is made of sand and clay like many of the traditional Mariamman deities, and hence unlike many other Hindu deities there are no abhishekams (sacred washing) conducted to the main deity, but instead the "abishekam" is done to the small stone statue in front of it. Thai Poosam, usually occurring in the Tamil month of Thai. All the Fridays in the Tamil months of Aadi (July 15 - Aug17) and Thai (Jan 15 - Feb 15) are celebrated in a grand manner. the Chithirai Chariot Festival is celebrated for a period of 13 days. 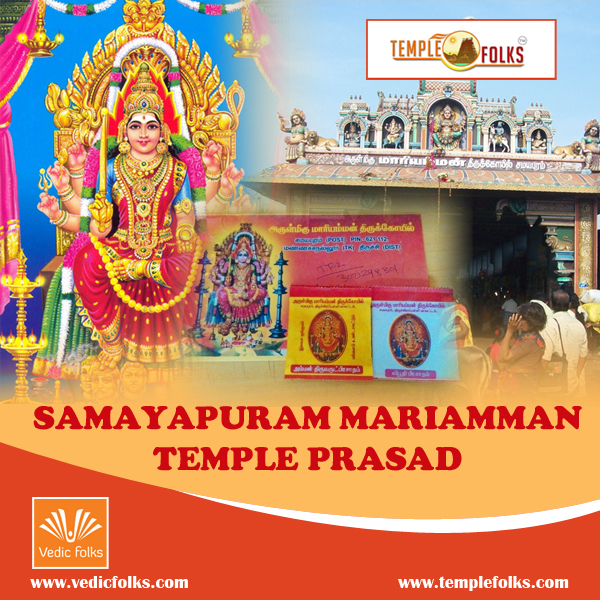 You will be receiving the blessings of Samayapuram Mariamman along with the special worshipped prasadam and the photo of Samayapuram Mariyamman.